Nearly a month after Guardians of the Galaxy Vol. 3 director James Gunn was fired from the third installment in the franchise by Disney, the director's fans and coworkers are still not giving up on trying to convince Disney to hire him back, and recent reports claimed that Marvel Studios President Kevin Feige was even fighting to keep Gunn on board. 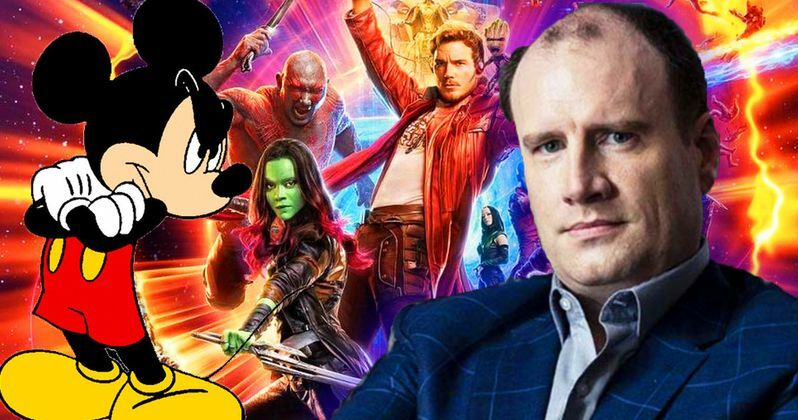 Unfortunately, according to a new report, Disney will be standing firm on their decision and Kevin Feige is now agreeing with the studio's ultimate decision. The decision for Disney to cut ties with James Gunn first arose last month after a number of his less tasteful tweets from a decade ago resurfaced online. Desperate to keep their family friendly image intact and to not receive any of the backlash that Gunn was receiving, Disney fired Gunn from 2020's Guardians of the Galaxy Vol. 3. Millions of fans were outraged by this decision, and even the Guardians of the Galaxy cast has spoken up about the issue, with the entire main cast signing an open letter to get Gunn rehired. Dave Bautista, who plays Drax in the franchise, has even threatened to quit if Marvel Studios don't use Gunn's script for the three-quel. The latest report of the Gunn fiasco claims that James Gunn was actually asked to sit down and meet with Alan Horn, the studio chairman of the Walt Disney Company, where Disney made it clear to Gunn that he would not be rehired. One person who was not in attendance for this meeting was Kevin Feige, who will still be producing Guardians of the Galaxy Vol. 3. According to Variety, Feige was out of town at the time and was unable to be in attendance when Horn and Gunn sat down. Unfortunately, it looks as though the Marvel Studios President would not have been much help in the matter. Earlier reports claimed that Feige had been pushing to get Gunn rehired, which had apparently occurred through "back channel conversations." The decision to fire Gunn wasn't made by Feige or anyone else at Marvel. Instead, it was solely decided by the higher-ups at Disney. Disappointingly, even if it was true that Feige was pushing to keep Gunn on board, this latest report claims that Feige has come to terms with Disney's decision and is no longer pushing. While this entire situation is certainly disappointing to Marvel fans who wanted to see Gunn return to direct the third Guardians of the Galaxy movie, it is understandable why Disney made the decision they did. Disney tries more than nearly every studio to hold onto their family friendly image, and rehiring a director that they fired for making pedophilic jokes would certainly do more bad than good for their image. Feige more than realized this and chose to side with Disney in order to save the image of Marvel Studios as well. While it's still possible that we could see James Gunn return to Marvel at some point down the road, this report from Variety makes it seem incredibly unlikely. Kevin Feige was theoretically the only person who could have changed Alan Horn's mind, so it's safe to say that James Gunn's last hope has thrown in the towel. Hopefully Feige will be able to find a decent director and script to replace Gunn for Guardians of the Galaxy Vol. 3, which is slated to enter production early next year.